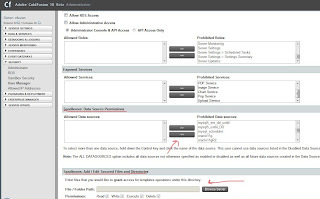 Adding users for Administrator & RDS access was a very nice enhancement in ColdFusion 8. With this, Root Administrator can create multiple users with different Roles. Need of having multiple users is self explanatory. A user can be added to Administrator and given access based on role. Remote Development Services (RDS) access should be granted if a user needs to connect to ColdFusion Builder, Dreamweaver etc. Till ColdFusion 9.0.1 it was possible to allow access to certain Sandboxes to these users. However it is changed in ColdFusion 10. There is no need for allowing access to Sandboxes. Instead when RDS access is enabled for a user,access to data sources and files/directories should be given. Else the user will be able to access full drive using RDS. Because these are required for RDS, one can't add/modify/delete these settings if RDS access is disabled for the user. It is a security recommendation as well, to keep this option selected even when there are no users defined. To create a new user, go to Security -> User Manager and click Add User. Fill the form (see Figure 2, Figure 3).Giving a strong password is a good practice. 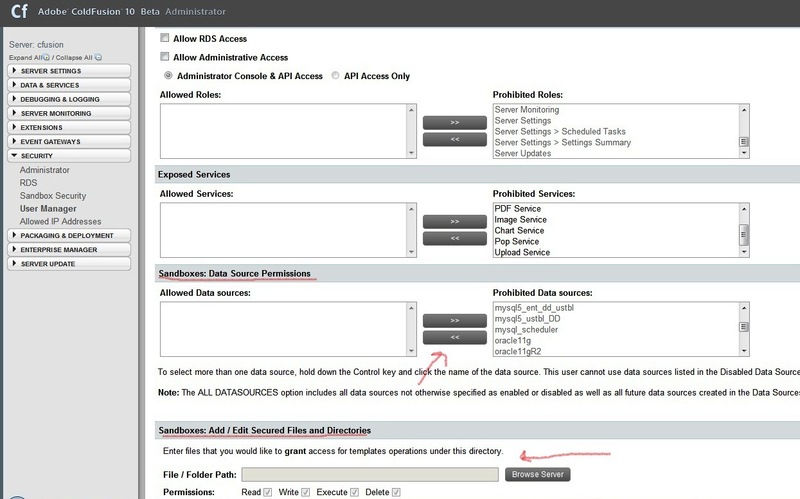 "Sandboxes: Add / Edit Secured Files and Directories" (See Figure 3). Appropriate access should be granted for data sources and files/Directories. Very nice feature set. Can you please allow periods in the user name? The Federal Gov uses firstname.lastname for everything and this breaks that pattern.